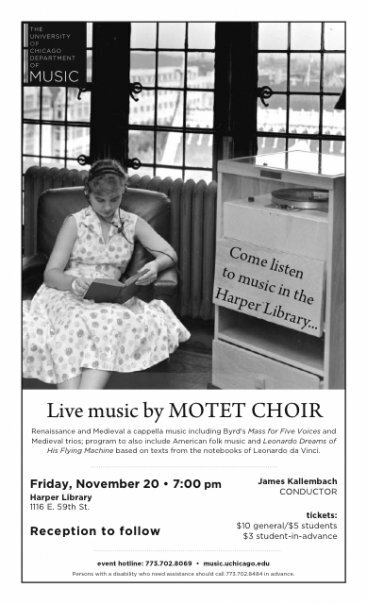 The Motet Choir recently sang for the first time in Harper Library. A new space for audience and singers alike, this posed some challenges, but mostly rewards, for all involved. The results were particularly stunning, as evidenced by the footage here. There were some notable performances of Medieval literature in small groups. It looks like this will be a repeat event. 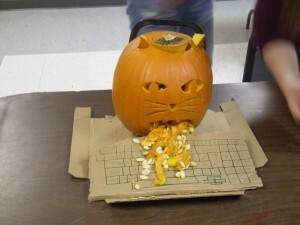 This year's winner: a pumpkin depicting a real-life event in the life of the choir director. 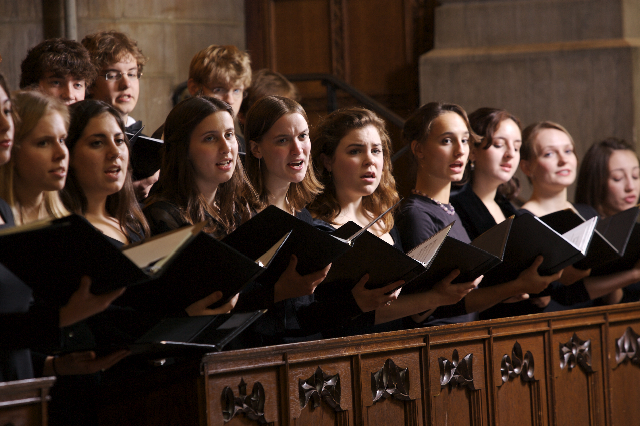 Carving pumpkins, roasting marshmallows, and campfire singing may seem an unlikely way to cajole students into appreciating choral repertoire and singing it well, especially choral repertoire written before 1700. However, brief epiphanies suggest otherwise: a particularly good run-through of a Byrd movement, or voluntarily singing more William Byrd on the bus ride home. In the liberal arts context these rituals are truly, albeit indirectly, paying homage to the art of vocal polyphony. Sung masses like these are far from most people’s experience. Something of what motivated Byrd and Tallis to continue to compose this music in the shadow of political opposition must motivate non-music-major students to put down the i-pod and sing a modal piece of music, so foreign from their musical culture, and, one might add, using a skill that is completely non-transferable to the rest of life. The aesthetics of this music are so far afield of even what most people consider ‘classical’ music: tuning each musical interval, letting these sounds move freely yet emphasizing the graceful flow of well-made consonance, and then the exquisite and cherished dissonance. This strange little ritual: pumpkins, campfires, etc., although not a covert Elizabethan mass, still makes the music new and special and somehow vital to our lives. This is music that is worth keeping around, worth the drive to Wisconsin, worth the time it takes to appreciate and worth the pains it takes to sing well. On Friday October 9th at 10:30 AM the 500th Convocation of the University of Chicago will feature the world premiere of Shulamit Ran’s Ad Sciendam… Members of the University choirs have carefully prepared this stunning new work. 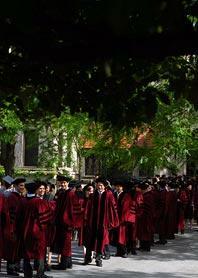 The text incorporates the Book of Wisdom, both in Hebrew and Latin, as well as the motto of the University of Chicago: Crescat scientia; vita excolatur (Let knowledge increase from more to more, that life may be enriched.) The ceremony is free and open to the public. Rockefeller Chapel Choir will begin the year with Oldroyd Mass for the Quiet Hour, Vaughan Williams Antiphon, and a little world music from Missa Luba. We have the biggest choir in the past five years, so it should be a glorious sound in the Chapel. It is already that time again, please encourage all to sign up early: Auditions Link. Also, check out last year’s season in CHOIRnews. The nationally syndicated radio show Pipedreams features our wonderfully restored organ and University of Chicago choirs on their September broadcast. There are performances by our beloved organist Tom Weisflog, as well as concerts from the past year and audio files of our first two commissions! 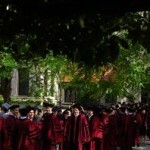 Welcome to CHOIRblog, the blog that’s all about choirs at the University of Chicago. Check in here for choral events, posts about choirs, commentary, photos and audio clips, and just about anything else that is choir-related at the U of C.
Friday December 4 at 8 PM: Handel's Messiah at Rockefeller Memorial Chapel. Follow link below to the Music Department's website. 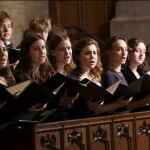 Sunday December 6 at 5 PM: Advent Vespers concert with Rockefeller Chapel Choir. The first time this event will be done entirely in a concert format. Follow link below to Rockefeller Memorial Chapel's website for more information.